There may be times when you need a little help in navigating and using Spotify from your Spotify friends. 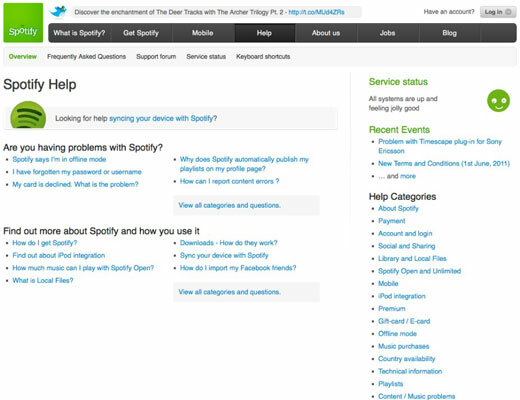 You can always e-mail support@spotify.com with your question or log into Twitter and send a tweet to @spotify. Be sure to include any information that might help the support team, including your username, so that they can investigate the issue. The best way to get help is to use the Spotify Support form, which includes all the fields you need to enter to help the team help you. Spotify’s official website is worth highlighting because it includes a lot of handy frequently asked questions (FAQs) and step-by-step instructions. Some of the answers in its archives do need a bit of a cleanup because they relate to earlier versions of Spotify and have outdated pricing and screen captures, but for the most part, the information you find is up to date (and any older information should at least point you in the right direction). Go directly to help to find the most popular Help topics and links to the main Help categories.